The reasons for the referral were vast: fear of dying, fatigue, and depression symptoms such as inactivity as well as social and emotional retreat; the teenager could not think about anything else other than his (to him unknown or awkward) physiological experiences such as dizziness or an extra systole could be the first signs of life-threatening diseases (e.g. brain tumor or heart disease). Numerous medical examinations, sometimes in emergency medical consultation, revealed no medical diagnosis. Since these problems did not only occur only at home, but also at school, significant social integration and achievement problems also arose. For example, about once or twice daily the patient had to leave the classroom, complaining about symptoms, and demanding immediate access to a rest room, where a personal school assist would help him to rest until the symptoms faded. After usually about 20-30 min, he returned to the classroom, to be met with the dismissing looks from peers and also at times from teachers. In weekly outpatient psychotherapy sessions, we first started to build up a viable relationship by exploring resources, strengths, and positive schemas. The idea of working with positive schemas is not new in Schema Therapy (ST, e.g. Early Adaptive Schemas by Lockwood & Shaw, 2012; Lockwood & Perris; 2012), but in ST with Children and Adolescents (ST-CA) we systematically use it in order to bring into awareness and reinforce the patient’s positive experiences, and connect them (internally) with significant others in their lives. For that reason, we interpret the absence of an early maladaptive schema in a pragmatic way as a presence of the corresponding positive schema (e.g. trust if mistrust is absent; stability, if no instability schema is prevalent; and so on). Peter Graaf and I gathered from a heuristic point of view typical expressions of positive schemas from 10 years upwards. However, in order to determine the patient’s most common expression of the 18 positive schemas, we invite the patient to “travel back” in his life history and imagine a socio-emotional key moment in which he/she has had an experience that helped him/her to build up this particular positive schema. For example, the expression “I am me, and an individual person“, represents the positive schema of individuality (opposite to the enmeshment schema). In an imagery exercise, we went back to the situation and the particular person who helped to build up this very particular attitude to himself. With other words, we got in touch with the helping person (need for attachment to good people), expressed our gratitude (emotional touching moment helped to use a positive affective bridge) and connected this experience from the past with a transitional object, i.e. semiprecious stone out of a box of different symbols. Finally, we put the symbol (here: stone) in a treasure bag of hand size, that the patient took home in his pocket. Having done so, we would fill the treasure bag week per week with a new stone or another small symbol, facilitating a new positive recollection, and thus connecting with another good person and moment. Systematically, we build up a positive self-image, creating a deep, satisfying feeling of being connected to good people in his life (Patient: „My life was much better than I thought“), and the awareness how good it is to have people around who take care of them. With the aid of a mode sketch (Fig. 1) we could shed some light into the so-called "black box" from a mode’s perspective: What exactly happens on the inner stage (mode level), when a stimulus (S, here the symptom dizziness) hits on a wounded person, and what response (R) is going to happen (, here “panic” feelings)? Along the sketch, we worked out different modes like the happy, clever & wise, self-assertiveness and resources modes, but also the vulnerable & fearful child mode. As the dysfunctional mode, that conceptualize the symptom, the patient would chose with a little smile the "dying-mode". When working closer with the latter we figured out three significant needs that was behind this mode: attachment, autonomy, and self-esteem. Attachment because he wanted to be emotionally close to a significant other, to be accepted with all his history and disabilities; autonomy since he felt deeply dependent on others (wheelchair), and now wanted to dominate others (Patient: They shall do what I want); and self-esteem since he needed desperately a good friend who would stick to him when peers are accusing him of “playing the dying swan”. Early maladaptive schemas were – due to paraplegia - vulnerability and defectiveness / shame (depicted in Fig. 1 as "wounds"), which were explored from every aspect (memory, cognition, emotion, and body sensation), identified by its triggers (e.g. dizziness) and validated against the background of the accident early in life. Fig 1: Mode sketch with small figures as modes of the patient; according to Loose, Graaf & Zarbock, 2013, 2015, adapted from Schulz von Thun, 1999, figures created by Graaf). 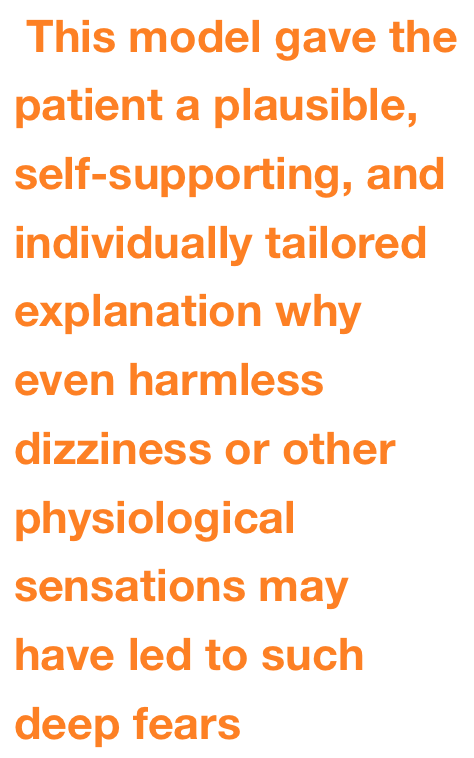 Maladaptive schemas are depicted as wounds, in this case vulnerability (*), and defectiveness/shame (**), which were triggered by the situation of harmless dizziness or similar bodily sensations. This model gave the patient a plausible, self-supporting, and individually tailored explanation why even harmless dizziness or other physiological sensations may have led to such deep fears, which could culminate at times in panic feelings of imminent death. 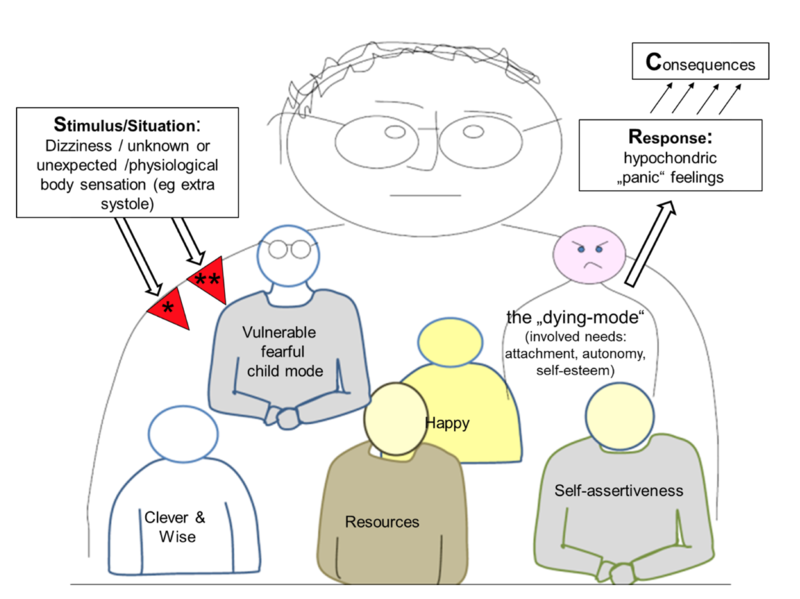 The identified needs of attachment, autonomy, and self-esteem could in the next step (treatment phase 3, see below) be met more readily by the clever & wise mode, for example by speaking first on the inner stage with other inner team members (modes), then on the outer stage with parents, and peers about the need e.g. to be emotionally understood. In this phase 3 the patient selected for every mode one smurf, that would fit best previously defined mode’s facets or properties. During this process, we allocated the mode properties to each selected smurf respectively, which allowed us in next step to obtain a first impression as to how the smurf team interacted with one other. Who was the boss (height of the smurfs)? Who liked whom or didn’t (smurf’s spatial distance from one another)? Who talked to each other and who didn’t (face direction of the smurfs)? And what happened, when all of the sudden a schema trigger like dizziness or any other body sensation appeared? What happened when peers were bullying him? The last two questions were addressed toward the appearance of the dysfunctional “dying-mode”. Altogether, we freely talked and investigated in a playful manner each smurfs wishes, innate needs, emotions and jobs, in other words: the mode’s function, including the pros and cons. 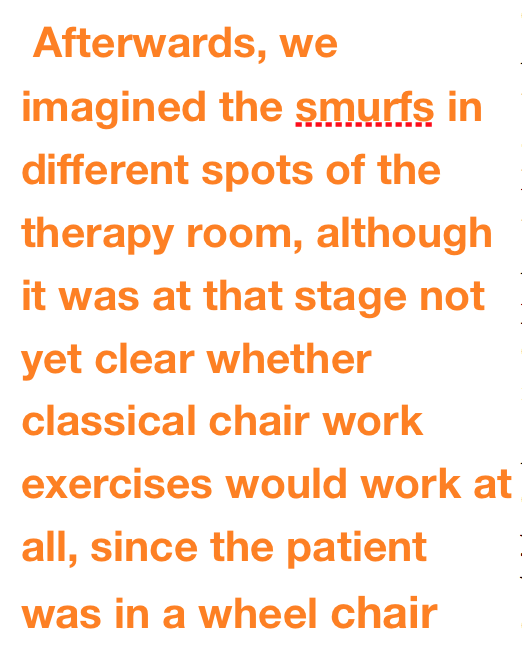 Afterwards, we imagined the smurfs in different spots of the therapy room, although it was at that stage not yet clear whether classical chair work exercises would work at all, since the patient was in a wheel chair, and could not simply change the chair. Would a change in position of his wheel chair in the room alone prove as helpful as the usual chair changing procedure? The answer is yes! Instructing and guiding the patient in his clever & wise mode to different locations in the room, we first validated, soothed and supported the vulnerable & fearful child mode by talking to him in a gentle, caring, and empathic way, recognizing and confirming his need for getting emotional support and warmth from the others. Moving from mode to mode, we allocated different messages to each smurf, thus giving each, that which was helping the vulnerable one to get its needs met, whilst simultaneously encouraging the happy mode to come more to the fore by contacting others to play play station with him for instance. The teenager’s internal overly self-critical or punitive mode was perceived by the teenager as playing a minor role and for that reason was acknowledged by the therapist as such (highlighting the patient’s autonomy), and therefore not conceptualized in the mode sketch. At the end, the patient could recognize and learn that intense panic feelings were mainly schema-, and originally need-driven, and in most cases not precursors of life-threatening diseases. Again, being aware of the accident early in life and its impact (e.g. needing help in many day-to-day activities), and the emotional echo of it (feeling shame and emotional defectiveness) the schema-triggered response of experiencing intense, life-threatening anxiety, made a lot of sense. However, the chair dialogues were realized only by changing the wheelchair position and direction, and it worked impressively well. By implementing further imagination exercises (e.g., Trip to the clever & wise mode), the patient was additionally supported in building up a stronger feeling of self-efficacy, for example , in addressing the clever & wise mode in order to help him overcome difficult moments in managing dizziness. In the accompanying parental work, psychoeducational classical schema-mode-clashes between parents and patients were illuminated and concrete functional strategies for dealing with dysfunctional modes were developed. After the clarification of the mode’s inner dynamic (phase 2) and intervening on mode’s level (phase 3), we then agreed in treatment phase 4 on distinct exposure exercises to check the feasibility and effectiveness of functional coping styles, in dealing with intense fears. For that reason, the parents were actively integrated in the therapy: What can they all do together when strong fears and panic thoughts arise? How could the parents support their son’s capacity, to activate and move the clever & wise mode to the fore, so that the emotional needs are the focus of attention and not primarily the symptoms and demands? We worked out a future script that would enable the patient to feel close to the parents, here father, who is silently, empathically holding his hand, avoiding too much talking. Additionally, he needed to be allowed to feel autonomy by giving him the opportunity to calm himself down, whilst accompanying him rather than demanding him to stop, and increase self-esteem by helping him realize, that techniques from the therapy would indeed be effective when applied constantly (e.g. using an associated smell that was connected with the appearance of the clever & wise mode, using safe place and screen techniques to find some relieve from the intense aversive feelings and fears). Homework exercises helped to deal with typical situations, strengthened the patient’s and parent’s self-confidence, and consolidated the script’s measures already prepared in the therapy. For school situations similar exercises were planned, prepared, and conducted, involving a classmate who was willing to provide support and who had attended a therapy session on one occasion. The frequency and lengths of therapeutic sessions were gradually, and in agreement with patient reduced, repeating not only the script’s details, but also resources, strengths, positive schemas from treatment phase 1 (relationship building), updating the explanation model from phase 2 (psychoeducation), practicing chair dialogues, and finally classical CBT-technique like exposure and self-assertiveness training procedures (phase 3 and 4), all accomplished by the patient’s clever & wise mode. Results: Sum scores of problematic behaviour in questionnaires like SDQ (Goodman, 1997) and depression inventory ​​were assessed in a pre-post-12-monthsFU-design and yielded substantial improvement during the therapy and sustaining positive effects in the follow-up measurements. Additionally, the frequency of interruptions in the classroom 12-month after treatment’s completion could be reduced significantly, and social integration improved substantially as well (meeting peers more frequently). Summary: The combination of schema therapeutic, mode- and need-guided treatment on one hand, and CBT-procedures yielded lasting effects on a teenager’s hypochondria symptoms with a relatively small number of sessions (24+6 for parents, each 50 min). Mode dialogues first with smurfs, and then with chair work exercises were possible in spite of the fact that the patient was confined to his wheel chair. Outlook: Well-controlled, randomized studies are needed to further investigate the feasibility, acceptance and effectiveness of the schema therapy with and without CBT-approach on the child/teenager, but also on the parents, in order to find out what is helpful in breaking schema-triggered, dysfunctional behavioral patterns, and finding functional ways of coping with emotional wounds caused by past injuries.